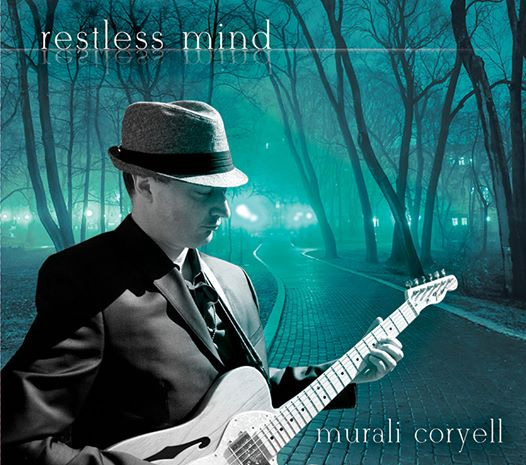 A blues record dripping with soulful guitar licks, smooth vocals, and sweet horns, Restless Mind is the latest release from soul-blues guitarist/singer/songwriter Murali Coryell. This is Coryell’s first studio record since his 2009 release, Shake it, Sugar, and it is safe to say that this was a product worth waiting for. Coryell’s best guitar solo comes on “I’m So Happy,” where his gruff, slightly distorted tone is balanced out by sweet, heartfelt playing. “I Can’t Give You Up” is a classic, soulful blues tune punctuated by tight horn arrangements, anchored by alto sax man Joe Morales, whose tone is eerily reminiscent of Cannonball Adderly, but whose playing uniquely his own; Morales has a nice solo on “Tag Along.” “Lonely Eyes” is a nice country-inspired pop tune that is sure to get some Coryell some air time. Coryell is very good at what he does: contemporary soul-blues. The record is not particularly eclectic, but it is quite good; Coryell has a great voice and his guitar playing is strong. Most importantly, Coryell’s guitar voice complements his vocal work; his guitar shows a slightly gruffer side of an otherwise sweet, soulful musical personality. The record isn’t earthshattering, but it is an enjoyable listen and features an artist who has found his sound and is sticking to it.